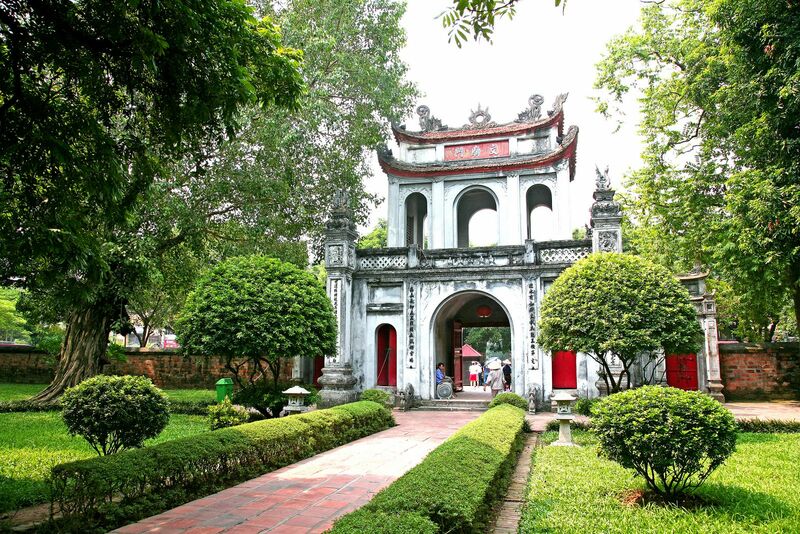 The Temple of Literature- Imperial Academy (Van Mieu – Quoc Tu Giam) is deservingly one of the top culture relics and forever the pride of the capital city when mentioning the thousand years of tradition that is Thang Long – Ha Noi. 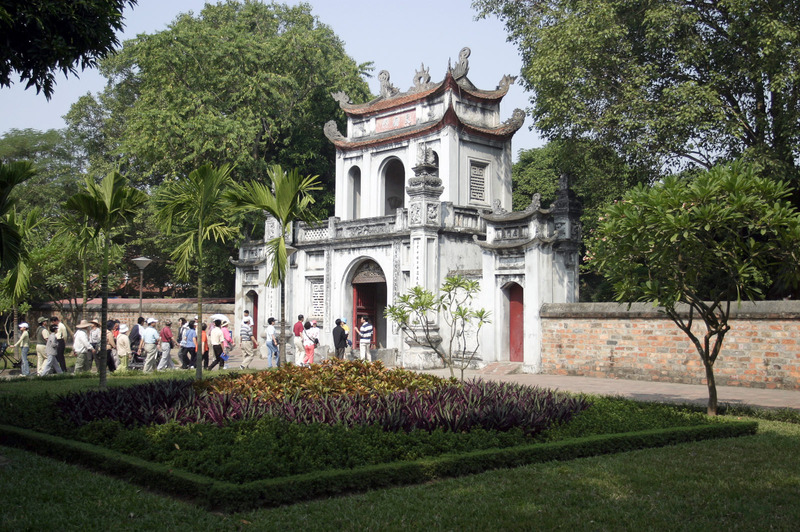 Probably, everybody has known or heard about the Temple of Literature, one of the most remarkable architectural feature in Ha Noi. This is the first university in Vietnam, and one of the first in the world. Come to Ha Noi and not visit Van Mieu, is like you haven’t been to Ha Noi at all. For me, as a local Ha Noi citizen, every time I come to the Temple of Literature, I learn something, even though the education purpose of the place has long been defuncted. It is another chance for me to find out something else about Van Mieu, about its history, architecture and the people involved. The Temple of Literature consists of 2 main parts: Van Mieu and Quoc Tu Giam. 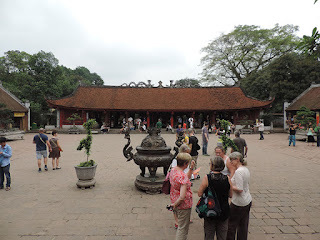 Van Mieu means Temple of Literature, worships Confucius and the greatest teacher in the history of Vietnam – Chu Van An. Quoc Tu Giam means the University for the nation’s sons. Basically, in its 700 years active (1076-1802) the university only accepted male students and had educated thousands of prodigies for our nation. According to records, Van Mieu was established in October 1070. In 1076, King Ly Nhan Tong ordered the construction of Quoc Tu Giam, right in the backyard of Van Mieu. Originally, it was the place of education for princes and royalties. Later, Quoc Tu Giam expanded and recruited talents from all across the country. The entire area of Van Mieu – Quoc Tu Giam has an area of 54,331 square kilometers, including Lake Literature, Giam Garden and the inner temple surrounded by brick walls. The inside of the temple is separated by walls into 5 sections. The Front Gate Dai Trung is the first thing that you will see when you come inside The Temple of Literature. On the top of the Gate is a line that says “Van Mieu Mon” which means the gate of the Temple of Literature. This is a two-storied three-doored gate. The Pavilion of the Constellation of Literature (Khue Van Cac in Vietnamese) is a unique architectural structure built in 1805 with 2 stories, 8 rooves. The lower level covered with tiles while the upper is made of wood. All 4 edges, each has a rounded window resembling the shining star. Khue Van Cac used to serve as the place for grading the tests of contestants. 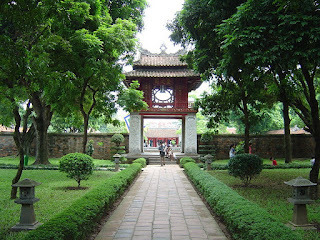 Today, Khue Van Cac can usually be seen as the symbol of Ha Noi. Its name means ‘Clear sky well’, though you might think that’s not the name to reflect the lake. But back in the day, it was exactly what its name says. Now, after a thousand years, the lake still serves as home for some aquatic life forms. The lake situates between 2 stele gardens. These gardens preserve 82 doctor steles from 1484 to 1780, which keeps the records (a sort of doctorate) of doctors in the period. Through the Main Gate comes the Courtyard, or Bai Duong Van Mieu. This courtyard is covered with brick tiles. The two buildings on the sides used to be the workplace of the best 72 students of Confucius, as well as famous businessmen from the Tran Dynasty. Now they are souvenir shops. At the end of the Courtyard are the Main House and the Grand Palace. Many valuable relics are displayed in this area. On the left is the Great Bell of Bich Ung. On the right is a rock plaque. The bell was cast by Nguyen Nghiem in 1768. The plaque has the word Tho Xuong on one side and instruction on the other. After the Main House we have the former-know-as Quoc Tu Giam, now it is known as Thai Hoc house as this is no longer a school and to honor the great teacher Nguyen Thai Hoc. It is here that the talented, the promising were chosen for teaching, for leading, for high positions. In the early years of the XIX century, when the Nguyen dynasty picked Hue to be the capital city, the school was closed and became a temple. In 1946, Quoc Tu Giam was burned down by the French. In 2000, the Thai Hoc House was restored to celebrate 990 years of Thang Long – Ha Noi and to honor the educational tradition of the Vietnamese people. If you want to discover other wonderful places other than Hanoi, here we offers some best tours from Hanoi as references to help you to have great time in Vietnam.